Thanks for your visiting us, we are offering a Free Shipping Promotion now. We only Charge Basic Shipping fees 40$ for any Great huge neon light signs. Free Shipping for any additional items if with combined Shipping in this limited time. We will use More Express Mail Service for package if more than 1 light. 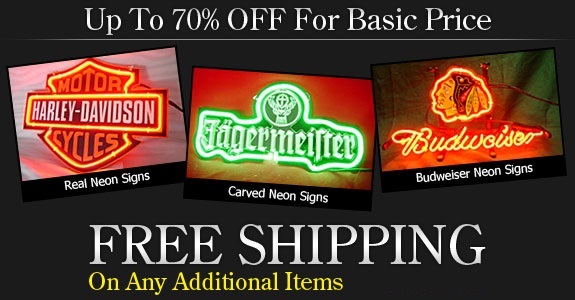 Please order your interested neon light sign today to enjoy this Great Discount. Please order it ASAP to make sure the items arrive before the day you need..
All the neon light signs will be a great Gift for your any relatives or friends. Please share this Promotion with your friends have interest in our neon signs.